A beautiful chart from astronomer Guy Ottewell, showing the evening sky on Astronomy Day 2018. Plus links to Astronomy Day events and other info. View larger. | Chart by Guy Ottewell. Or just go outside and look! 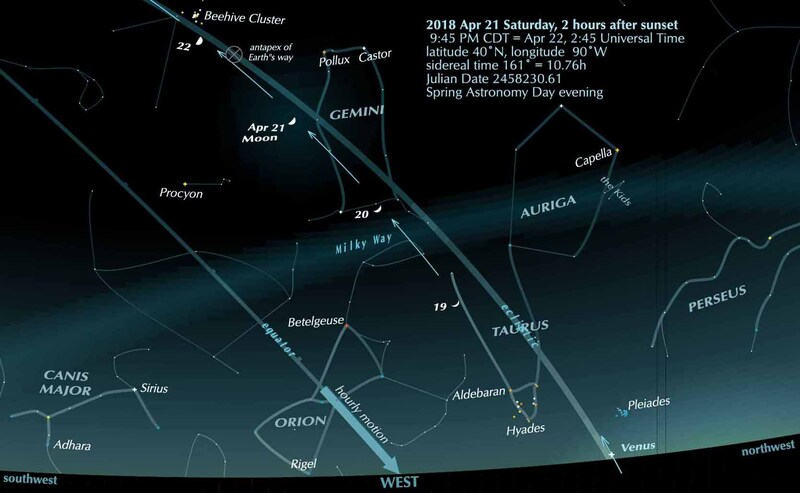 At the time and place of our chart – Astronomy Day evening, April 21, 2018 – Venus is just setting. Though, as always, brighter than any star or other planet, it has climbing and brightening to do before reaching its climax in the evening sky four months from now. Over in the east, the second brightest planet has risen: Jupiter, which will be at opposition on May 8-9. The other planets will rise later through the night, being on the morning side of the sun. And in the northeast, Vega has risen, the bright star of the constellation Lyra, from which radiate the Lyrid meteors. 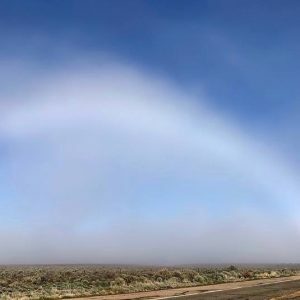 The probable peak of this shower is the morning of April 22, and they may already be putting on a show. 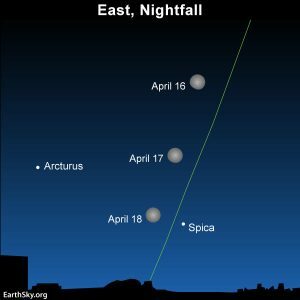 This is one of the advantages of the timing of the spring Astronomy Day: a Saturday of late April or early May with the moon observable but not too dazzling. The moon will be at first quarter also in the night between April 22 and 23. There will also be a Fall Astronomy Day, on October 13. 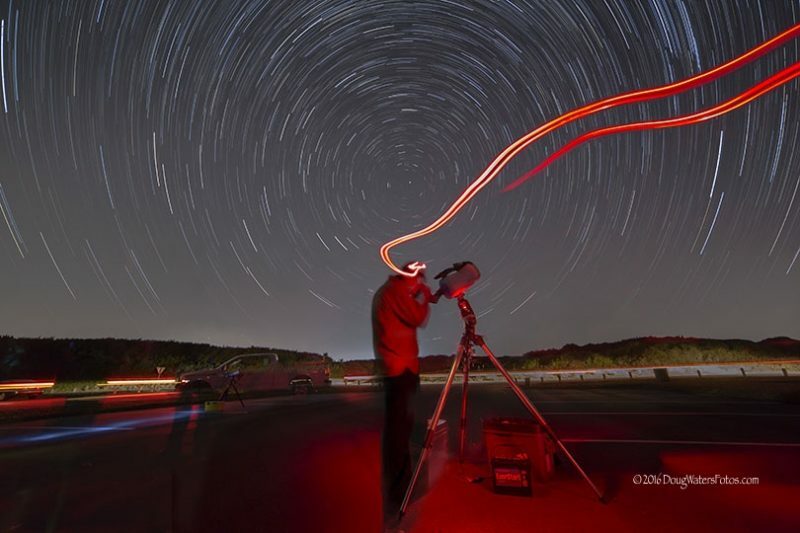 North Carolina’s Fort Macon State Park hosts frequent dark night astronomy programs open to the public. With the help of the Crystal Coast Star Gazers Group, ‘scopes are set up for public viewing. In this photo, group member Fred Angeli”s headlamp leaves a streak of light as he approaches his ‘scope to focus on the night sky. Bottom line: Chart showing the evening sky on Astronomy Day, 2018, plus links to sky objects and events.